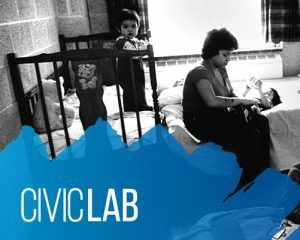 The Saint Paul Public Library’s Civic Lab is an interactive display that addresses issues impacting the community and engages citizens in conversations relevant to their communities. Visit your local branch to learn more. Which housing issue are you most concerned about in your neighborhood? Housing: Where do we live and how did we get here? Learn about these timely housing issues varying from homelessness to aging-at- home. Using New Orleans, Detroit, San Francisco, and New York as examples, Moskowitz describes how revitalization and displacement go hand in hand. The author describes a shift away from traditional senior living, and a shift toward architecture that promotes active aging. Two city planners provide advice on urban development. Millions of people in the United States live on less than $2.00 a day. Edin provides personal accounts interwoven with statistics and reports about this growing population. Take a journey with "workampers," older Americans who have become itinerant workers in order to make ends meet. Quart writes about the economic, emotional, and social hardships faced by middle-class families in the United States. A thorough examination of how federal, state, and local governments systematically imposed residential segregation, still found in metropolitan areas today. An analysis of the Ghetto, from its beginnings in the 16th century to its manifestations in the present-day world. A darkly funny memoir about Karp's experience of losing her corporate job in the Great Recession and becoming homeless in a matter of days. Minnesota writer John Fritz recounts his turbulent past and how he turned his life around. After working as nurse running a new medical clinic for the homeless, Ensign became homeless herself. This is her reflection on how her experience changed her views on homelessness and the health care system. Journalist Sarah Smarsh describes her experience growing up in rural Kansas during a time of economic instability. The story of one of America's most notorious public housing projects: Chicago's Cabrini-Green towers and row houses. Dr. O'Connell spent thirty years caring for people experiencing homelessness in Boston. These are his stories. After surviving a terrible childhood and homelessness as a teenager, Murray went on receive a New York Times scholarship to attend Harvard. Mason shares her story about escaping poverty, and addresses the ongoing challenges that make it almost impossible for others to do the same.